Facebook and Twitter are important tools for building a community of supporters and keeping the conversation about tolls going. They will be the first places where we provide you with updates and action alerts regarding tolling activity. 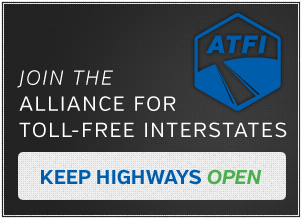 If your association, business or local government would like to join our growing alliance in opposition to tolls on existing interstates, please email us at info@tollfreeinterstates.com or download the Membership Application. If you are an individual who is concerned about tolling, we want to stay connected with you. Sign up today to receive email notifications and information on how you can take action to oppose tolls. We need your help. Add this web badge to the homepage of your website by copying the code below to your website in order to help recruit others to join ATFI. The more people that we have working together, the better our chances of defeating tolling initiatives. Encourage your friends, coworkers and family to join the alliance. Writing a letter to your local newspaper is one of the best ways to let people know about the negative impact tolling will have on your community. Under the “Tolls” tab, we have provided you with information to help you write your letter. Your newspaper’s website should have the information you need to send your letter, but feel free to email us at info@tollfreeinterstates.com if you have any problems.